What would you pay to see college basketball played on an aircraft carrier in Florida? To see two Division I powerhouse programs work out the kinks in their season-opener? To be part of a sporting event so unique … well, rare … well, different … well, look, it’s becoming a fad and we can’t stop it. At this rate, the UFC will hold a pay-per-view from the well deck of an amphib in six months (Free advice: Brian Stann should headline). We digress. How much would you pay? If you answered less than $500 a pop, you’re out of luck, according to multiple reports. 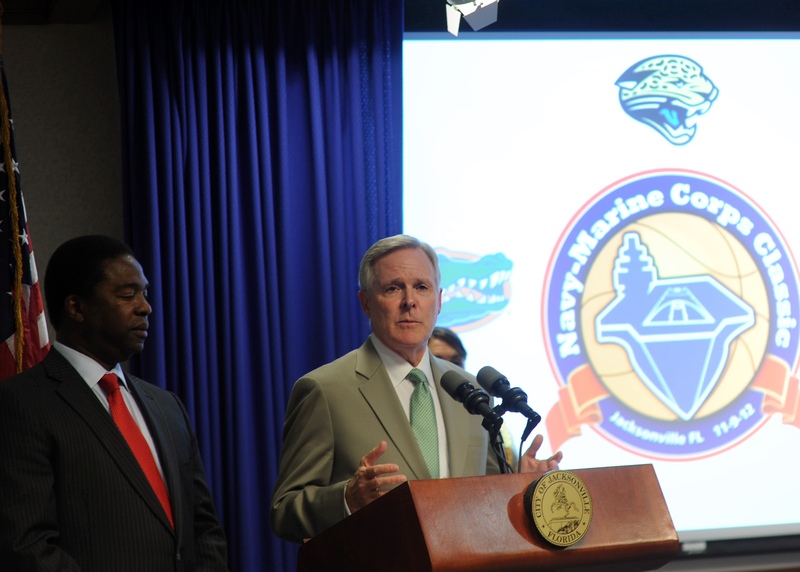 Event organizers are selling two-ticket packages to the Navy/Marine Corps Classic, set for Nov. 9 at Naval Station Mayport, Fla., aboard a yet-to-be-named carrier, for a minimum cost of $1,000. The packages include more than the Georgetown-Florida hoops game — fans also get tickets to the Jacksonville Jaguars-Indianapolis Colts NFL game in Jacksonville the night before, as well as other benefits, depending on the package. A portion of the costs goes to buying tickets to the NFL game for military families, according to a Jacksonville city official. This report lists packages up to $50,000 and includes a number to call, starting Monday, if you’re up for the trip.